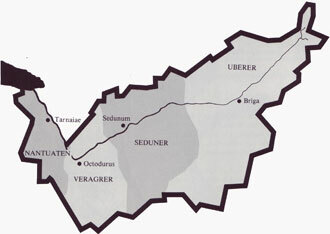 Settlement history of the Wallis from the Celtics to the "Alemannen". The "Oberwallis" today consists of the German speaking area of the Wallis and extends from the Furka up to the Raspille (Sierre). Originally it was settled by the Celts (Uberer, Seduner, Veragerer and Natuaten). In today`s German speaking area lived the Uberer. Around the year 40 BC, today’s Wallis was occupied by the Romans and due to it’s importance as a traffic hub (Summus Poenius, Grosser St Bernhard) it became a Roman province with Roman citizenship rights, and therefore the whole area was Romanised. It is a known fact that the Alemann from Haslital in Goms immigrated here. In upper Rhonetal is a long line of "Dörfer" (villages) where the usage of the syllable –ingen in place names is common: Ulrichen (Uolrighingen), Reckingen, Gluringen, Selkingen, Blitzingen. This syllable designates the affiliation of a group of settlers to the "Dorf" (village) founder or land owner. Thus Reckingen originally meant «Sippschaft des Recko (Kinship of the recko) ». The Gommer name however, forms the natural continuation of the –ingen chain in the Bernese Oberlandes, which ends with Meiringen in the Haslital. The immigration over the Gemmi or the Loetschenpass is more difficult to prove. Walliser German is not uniform. It covers two groups of dialects. For example, “spring” in the Western Oberwallis is uestag, in the east langsi. Below Brig one says liwwu, above Brig hirme. In addition, Luewe/liwwe is north of the Loetschenpass and ghirme is common beyond Grimsel. That points to migration going both ways.